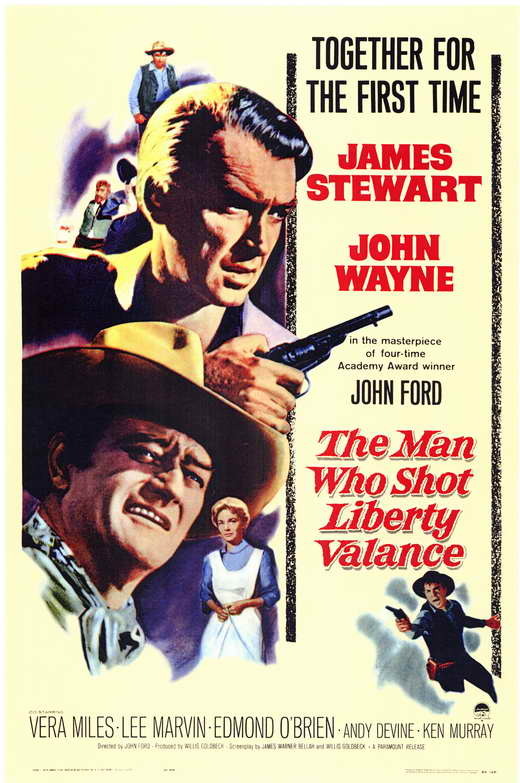 The film begins in 1910 when a successful aging U.S. senator Ransom Stoddard (James Stewart) and his wife of twenty-five years Hallie (Vera Miles) return to the small western town Shinbone, where they met, to attend the funeral of Tom Doniphon (John Wayne) a man known in the town as a good man but undistinguished. However, as Ranse begins to tell Tom’s story, it is evident that there is more to him – and Ranse and Hallie – than meets the eye. What a movie. The opening scenes alone are enough to put a lump in your throat, even if you’re only seeing it for the first time and you don’t even know what’s going on. There’s so much aching poignancy and melancholy in both of the ‘present day’ parts (the one at the beginning and the one at the end). As for the middle of the film, well, it’s one of the most entertaining, thoughtful westerns I’ve ever seen. The story is tight and fast-paced and there’s something about the stark beauty and simplicity of black & white that I love, especially in this film. And, again, it’s pretty emotional. I definitely teared up a couple of times. And the characters! TMWSLV is bursting with lovable characters. Vera Miles as Hallie is one of the standouts of the film, in my opinion, with her expressive acting and strong character. She’s one of the best female characters I’ve ever seen in a Western movie. James Stewart is great, as usual, and as for the bad guys…Liberty Valance is played by Lee Marvin and he makes for a delicious villain. Very scary, very memorable. And one of his sidekicks is played by Lee Van Cleef! It doesn’t get any better than that. But I watched this movie for John Wayne, really, so I’ve saved talking about him and his character, Tom Doniphon, for last. Now, truth be told, John Wayne isn’t one of my favorite actors. And I haven’t much cared for him in any of the films I’ve seen him in thus far (this, The Horse Soldiers, and The Longest Day), but I went into my re-watch of TMWSLV with an open mind, determined to be fair. And you know what? I actually didn’t mind him much at all – in fact, there were several parts where I liked him quite a bit. Of course, it helps that Tom is such an awesome character: sure he’s rough around the edges and he’s tough (naturally) and more than a little rude at times, but it’s near the end where you really realize how much he cares for Hallie and just how heroic he is. So I quite liked him. Overall, The Man Who Shot Liberty Valance is one of my favorite westerns ever and John Wayne is a big part of that. Have you watched it yet? How did am I jut finding out that John Wayne and Jimmy Stewart made a movie together?!? Thanks so much for posting this! Seen it once, but it was when I was still drinking (so at leas 7½ years or more ago). It’s high time I watched it again. Thanks for joining the blogathon. Thanks for co-hosting it. 🙂 I had fun! The hair stands up on the back of my neck and tears come to my eyes when John Wayne as Tom Doniphon says “You didn’t shoot Liberty Valance”. A true moment. I’ve not seen this, no . . . Right now, I’m in the middle of making a grand-total list of all the movies I’ve ever seen, combined with a list of all the movies I WANT to see. Guess how many movies I’ve seen thus far in my life? I knew it was pretty low; but I didn’t really realize it was THAT low. Haven’t seen either of those movies yet. 😛 I’m planning to watch Ant-Man sometime soon, though. WOOT. Oh my gosh, I love this movie! This movie… *sighs* Jimmy Stewart is my favorite of all time! So any movie with him is great, but this one is so terrific, and yes, Vega Miles was terrific. We recently watched another movie with Jimmy Stewart and Vera Miles and although the movie wasn’t all that great, their chemistry’s just great. I believe it was called… the FBI Story? Yes, yes it was. I mean, it was worth watching, but I don’t think I’d ever choose to watch it again. So am I. 🙂 It’s nicer to like an actor than dislike him, right? This is such a great movie! I also love that it has one of my favorite 60s Western character actors in it — Strother Martin! Yes, I have watched this film before. I’m not sure if this is one of my favorite westerns. I think I like Big Country or Shane more, but it is certainly a great movie! I love how you used aching poignancy to describe the movie. Aching poignancy is a phrase that really fits the movie. I haven’t seen this for a few years, but it so happens I’m giving it to a friend for Christmas because she, like me, grew up watching John Wayne and Jimmy Stewart movies, and she doesn’t have this one (last time I was at her house and eyed her movie shelves, anyway), so… perfect Christmas gift. I get chills from just thinking about this movie. 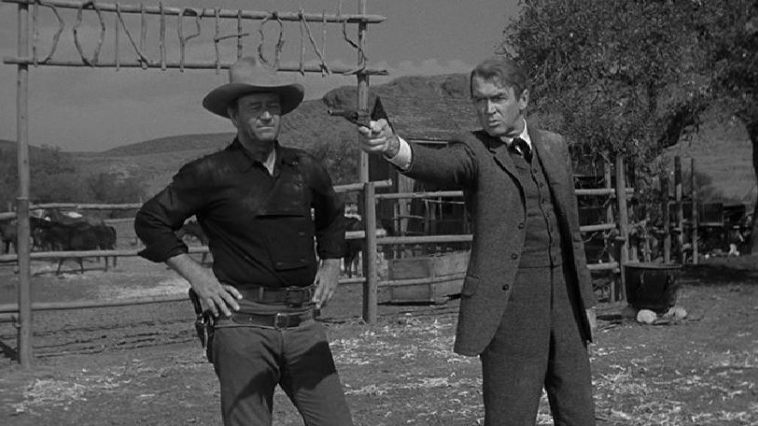 Like Caftan Woman said above, that moment where Tom says, “You didn’t kill Liberty Valance” is so powerful. I’m glad you’re giving John Wayne a chance and are open to watching more of his movies. Especially since I tucked one into your Christmas box — but I won’t tell you which one! You can have that to look forward to 🙂 I sent it off yesterday, so you’ll get it… eventually. Ooh, I’m looking forward to that! I have everything I’m putting in your package thought out…I just need to put it all together and actually mail it. Nope, I’ve never reviewed it. I’ve been on a bit of a JW kick right now — started with Stagecoach, then I watched Without Reservations because I thought I was going to review that for this event, but then someone else decided not to review The Quiet Man, so I switched and watched that to review. And then this week, DKoren introduced me to Donovan’s Reef, which is actually a Christmas movie!!! That I had never seen!!! With John Wayne and Lee Marvin as BUDDIES!!! In fact, it’s a wacky buddy comedy of sorts, and also has Elizabeth Allen in it (aka the annoying photographer chick from Combat!). It was quite amusing. So you know, more John Wayne would not be amiss. My mom’s coming next week, so maybe I’ll see if I’ve got anything of his she hasn’t seen yet or is in the mood for. And then maybe in January, I’ll pull this out and rewatch it. Donovan’s Reef sounds AWESOME. 🙂 I’ll have to check Youtube/the library for it. I’m not sure if I’d call Donovan’s Reef awesome. Wild, and woolly, and full of fleas, and never been curried below the knees — yes. It is quirky and silly and altogether, I approve! Oh, I meant awesome in the sense of ‘this sounds like a movie I could really love because Christmas and Lee Marvin and comedy’. 🙂 Definitely going on my to-watch list. And I’d have to third the weighty moment of “You didn’t kill Liberty Valance” Wow. Oh, this movie brought tears to my eyes as well, in several places. Wayne and Steward are two of the actors dearest to me, and I love Vera Miles as well. It’s really a movie that hits home, isn’t it? Personally, I think Ranse is a better choice for Hallie, but Tom’s relationship with her makes me so, so sad.